As I was working on the post about Joining the Tri to End Homelessness team, Ryan walked through the door after his day at Genesis Home. He was at work late this evening to assist a volunteer who visits the house on weekly basis to involve the families in cooking classes. The classes are part education, part fellowship, part family-free-for-all, and a whole lot of fun. I needed to a dose of inspiration today. I'm in the midst of one of my job's busiest periods of the year; the days at my desk have been long ones lately; and I also have to work for a big chunk of this upcoming weekend. Ugh. Thankfully, it's a training rest week, but even so, I couldn't quite muster up the motivation to complete today's scheduled swim workout. Double ugh. On days like today, I'm grateful for the perspective that the Tri to End Homelessness campaign provides. Two years ago, Claire and her 12-year old daughter Michelle were enjoying a comfortable life. Five years out of a divorce, she had a full-time job with great benefits. "We weren't rich," she said, "but we certainly weren't struggling, either." In September 2006, Claire had a non-malignant lump removed without much concern. Six months later, however, she had undergone two more surgeries and was too ill to work. "We lived on savings for several month. When that was gone, I cashed out my retirement and 401 K. When that ran out I started selling furniture." By the end of summer, they were broke. Michelle stayed with friends while Claire lived in her car and motels as she tried to find opportunities elsewhere. Without a home or any other options, Claire and Michelle moved into Genesis Home in September 2007. "It was a difficult time in our lives," said Claire, "Genesis Home gave us time to rationalize all we have been thought and plan our next move." She approached each day with military-driven discipline, enrolling in college classes, and applying to every job she could find. "I was eager to get back on my feet," she said. After three months at Genesis Home, Claire landed the job of her dreams. She and Michelle couldn't be happier with their new apartment. She insists that they are better people because of the challenges they've overcome. "Everything we went through in the past year made us stronger," she said. "Genesis Home helped us recover while providing a fresh start for our new life." "These days we're smiling more; we're more appreciative for all of our life's blessings," Claire said. "I have so much peace in me and it came from Genesis Home." You've been thinking about it, haven't you? There's a 5K somewhere near your home just about every weekend. Your co-worker just signed up for a charity bike ride. And triathlons seem to be all the rage. Or, perhaps you're a seasoned endurance athlete. You've been at this game for a while - waking up early, charging out the laps, clocking through the miles -- and there's that place inside you that wonders how this season might be different. How you could be different? How you could make a difference? If you've been thinking about it, the Tri to End Homelessness team might be your answer. I've known all along that Tri to End Homelessness is much bigger than my sister and me. It's about all of us, about what kind of people we want to be and what kind of community we want to live in. It's about creating the change we want for our worlds, inside and out. Now you have a chance to be an even bigger part of that change. Genesis Home is recruiting other athletes to raise awareness about the homelessness in our community and raise funds to support the critical work that they do to end homelessness once and for all. 1. Pay a non-refundable $25 registration fee, due with your application. This amount covers your Tri to End Homelessness t-shirt and is not applied toward your minimum fundraising goal. 2. Raise a minimum of $400 for Genesis Home by June 1, 2008. That's only a little more than $30 per week! 3. 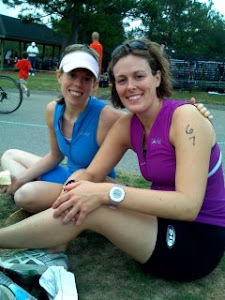 Enter and race in a Spring 2008 triathlon of your choosing. You will receive a Tri to End Homelessness wicking t-shirt to wear proudly. 4. Keep Genesis Home informed of your efforts! In exchange, Genesis Home staff will work with you to develop a fundraising plan, track all of your donations, and send Genesis Home materials and donor thank you notes to all of your generous donors. I'll be serving as your official Tri to End Homelessness "Team Motivator," sharing your stories with blog readers, pointing you toward training resources, brainstorming innovative fundraising strategies, and sending you example letters to send to all of your family and friends. So, if you've been thinking about it, contact Shannon Moriarty at Genesis Home TODAY. New Ways for YOU to Tri to End Homelessness! Thanks to the generosity of returning AND first time donors, Tri to End Homelessness has generated over $700 to support Genesis Home's work to end homelessness one family at a time! THANK YOU!! That's 10% of my 2008 goal: Raising $7,300 by November 1 in recognition of the 70.3 miles I'll be covering in my first half-iron distance triathlon! Make a donation straight to Genesis Home. Remember: Between now and June, all new donations and any increases in 2007 gifts will be matched by a local foundation! Be sure to mention Tri to End Homelessness when you donate. Visit the NEW Tri to End Homelessness store at CafePress.com. ALL proceeds (~$5-15 per item) will go directly to Genesis Home. If you don't see the graphic you like on the item you want, let me know and I'll make it especially for you! Many thanks to friend and designer Sydnor Elkins for creating all of the Tri to End Homelessness graphics! 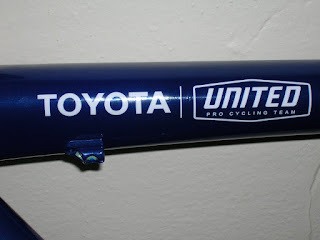 Make an offer on the 2007 Official Toyota United Team Fuji frameset I won as part of Toyota's Engines of Change Power of Sport national contest. And if you've really caught the Tri to End Homelessness spirit, consider creating a Tri to End Homelessness campaign all your own! That's right, Genesis Home is inviting other triathletes - seasoned elites and first-timers alike - to join the Tri to End Homelessness team! More on this soon. Contact Shannon Moriarty at Genesis Home to get the inside scoop. Tonight, eight families made of up of 34 homeless moms, dads, and kids are sleeping at Genesis Home. Your donation means these families will have a warm place to stay and the supportive services they need to someday soon move into a home of their own. Won't you join me in tri-ing to end homelessness? We CAN make a difference. Sweating, spitting, grunting like a wild animal, pumping my arms and legs and lungs and spirit up and over the last short bridge. Crossing the finish line after a quick four miles, reborn again. My first one of the year was Saturday morning and it was good. I stayed true to my intention and met my goal time. More than that, I fell in love all over again -- with running, with competing, with my own power. With only four miles in total, the race was over quickly. For the first time in running event, I took a place at the front of the start line. I looked around and couldn't quite believe I was there. Even though my plan was to go out fast, as I looked to my left (where my coach was flashing her thumbs up) and then to my right (where my super speedy Sage Endurance teammate Juliet was preparing for her own fast start), I admit that I wasn't quite sure that I belonged. We were off with the gun and, as usual, I had my "oh, crap...why am I doing this" thought about half a mile in. Luckily, I've learned a couple of things over the last year of training and this time I was prepared. I dedicated this race to N and wrote his name on the back of my race bib. N is a boy who currently lives at Genesis Home with his family. Like most of the kids living there, he's had a very, very tough life. But, also like most of the kids living there, he has a smile and lightness that make me warm every time I think of him. When I experienced self-doubt on Saturday morning, I thought of N playing with his friends, laughing without care, and running freely.... and then I ran freely too. Perhaps, just a little too freely during that first mile! At the 1 mile mark a race volunteer called out splits. As I ran past, I heard 7:26. Just six seconds more than the fastest mile I've ever run, I almost stopped right there and asked him if he was serious. Despite telling myself, "o.k. slow it down a bit, now" I was thrilled. I've been working on facing my fear of going out fast, on redefining myself as a faster runner than was I six years ago, on really going for it -- and that first mile was proof that the work is leading to progress. I slowed a bit too much over mile 2, but regained a more balanced pace for miles three and four. I stayed mentally focused and practiced my stride counting technique when things got really hard. I would have loved to have finished just a few seconds faster, but I'm very satisfied. The year is long and this is just the beginning. After two full days of rest, lots of fluids and calories, and a clarifying recommitment to my health following Sunday's incident, I took myself out for a test run on Tuesday morning....on the treadmill, at the gym, wearing my Road ID, with my husband at my side....just in case. I was happy to feel quite a spring in my step! Assuming that the rest of this week goes as planned (Well, as modified, since I've decided to reduce my workout load out of extra precaution), I'll be joining several Sage Endurance teammates for my first race of the year: The Coach Bubba 4-Mile Road Race. I have a time goal. I have a radical time goal. I have a super-secret radical time goal. However, I'm remembering the lessons from last year and instead am working to bring my focus away from my goals and toward my intention. For this race, my intention is to EMBRACE the mental and physical pain that comes with running ALL OUT. Yes, I choose to run this race. Yes, running at the top of my ability will be very difficult. Yes, I have several mental strategies that I can call upon- and this race will be very short! Yes, I am prepared to bring my very best - as I have it available to me on that day- to the line. - Of course, being surrounded by medical professionals at Kinko's did create quite a scene and, as a result, a small crowd gathered. The funny part? The woman at the machine next to me who just kept printing out her digital photos...not at all bothered by the woman laying on the ground beside her. Can I please have a dose of that mental focus during my next race?!!! - Being asked if I was pregnant about 27 times in the matter of 30 minutes! - Having the "Are you pregnant?" questions promptly followed by "Have you done cocaine, today?" TODAY????!!!! - The wonderful EMT asking about my racing, talking about his past attempts at running, and chatting away about a documentary on a woman training for the Marathon des Sables. Me? Trying to respond and be polite, but thinking "Dude, seriously, I REALLY can't think about, chat about, provide advice about training and racing right now. But, thanks for being interested!" After a very busy week at work, coupled with an intense second week in a three week block leading up to my first race of the year, I had an incident on Sunday that I'm sharing in the hopes that we all can learn something from it: I became severely dehydrated, had a fainting episode (in public, at a Kinko's in downtown Durham, no less)and ended up taking an ambulance ride to Duke's emergency department where I spent several hours. Two IVs of fluid, a chest x-ray (all clear), an EKG (normal), and a pregnancy test (negative) later, I returned back home safe and sound and am now fine - just really tired. The docs think I got really dehydrated and didn't eat enough yesterday (and probably all of last week). As long as it doesn't happen again any time soon and I don't develop signs of an infection, I'm a-o.k. I'm thankful for the good outcome, but the event was very scary for me -- and for my dear husband who arrived at Kinko's as his wife was having an oxygen mask placed on her face and IV started in public. I went from being o.k. to very not o.k. in about 90 seconds. My pulse was about 40 beats lower than it normally is and the EMTs could not get a blood pressure reading when they first arrived on the scene. So, what lessons am I taking from this? 1. Even though I think I'm drinking and eating enough, given the amount of calories I'm burning every week and the occassional very busy week at work when I get distracted and don't follow my normal consumption plans-- I probably need to be eating and drinking more (while paying attention to my electrolyte levels) --especially after tough workouts and even on rest days (which Sunday was). Nutrition and hydration need to be a top priority - every day. 2. I really have increased my physical activity significantly over the last two years -- and I should probably let my primary care provider know that. I often hesitate to bring up the fact that I exercise 8-13 hours per week, because I think "oh, that's not that much" or "oh,it's not like I'm a professional athlete," or "oh, I don't want her totell me to stop or look at me like I'm crazy." The reality is that despite who I hang out with, a lot of people don't do this. I need to let my health care provider know that I might little different than who she sees every day - so that she can help keep me in check. 3. I felt REALLY crappy after my long run on Saturday, abnormally crappy. Now I know that my body was trying to communicate with me and let me know that all systems were not go. Then, I simply chugged a little gatorade, gave myself a pep talk, and got on my bike for another hour. Probably best to listen to my body's whisper instead of waiting for the lesson to hit me over the head like it did on Sunday. I'm taking an extra rest day today and will be playing the rest of the week by ear. We'll see how it goes. Be safe and drink up! Thanks to help of Tri to End Homelessness supporters across the country, I was thrilled to be selected as the First Prize winner in Toyota's Engines of Change Power of Sport Contest. The best news? YOU now have a chance to (1) purchase a sweet new frameset to help you achieve your own cycling goals this year, (2) help me reach my fundraising goal of $7,300, and (3) support Genesis Home's work to end homelessness one family at a time. That's right! 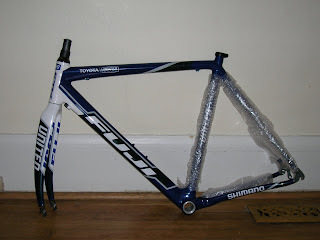 I'm selling my prize to Tri to End Homelessness. Details are available HERE. Set the gearshift for the high gear of your soul. Monday- A morning swim with breath pattern work followed by evening yoga. This week's yoga class focused on aparigraha, or non-grasping / non-covetousness. That combined with the prior week's class, which focused on using appropriate amounts of energy for appropriate tasks, and my current reading of Chi Running built the foundation for my week: How relaxed can I be and still go hard? Tuesday - Zone 5 ++ fartlek!! ...oh, and strength work in the weight room immediately following the run. There was spit and grunting and lots of sweat and perhaps some quiet cursing - but there was also the warm inner knowing that this, THIS, is what will take me to the other side. By the time I got home and showered, I had a bit of a hard time wrapping my head around the fact that I now needed to go to work for 9 hours. Incredibly satisfying and exhausting day. Wednesday - A fun, short morning swim (written by my coach's husband - thanks Wes!) and easy evening cadence-focused spin on Sunny D while my own hubby cooked dinner. Thursday - All intervals all day long: Morning run with cruise intervals and evening bike with aeobic intervals. I felt fast and happy throughout the day and focused on my form in both workouts: Where are my hips? Shoulders back and down. No grasping. Relax your jaw. Friday - Time to slay some swim dragons. I revisted the mentally tough swim workout that got the best of me two weeks ago and conquered the demons - not quite hitting my t-pace on every set, but coming really, really close -- while staying mentally present. The lesson: Stay relaxed...and try to not swim in the evening while hungry and tired! The best part of Friday? Treating myself to a massage in preparation for Saturday's tough run! Saturday - A 60 minute run with zone 4 intervals on the Coach Bubba course, followed by weights and lots of physical therapist-recommended stretching to complement my yoga practice and build strength in the hip that has bothered me in previous weeks. Compared with the trails and other soft surfaces I've been running on for the last few months, the asphalt 4 mile course felt super fast. Can't wait for the race! Sunday - Rest, walk around the neighborhood, host a dinner party for 9 and cheer on the Tar Heels. This week will bring more of the same -- speed work, intervals, and race day visualization. If this morning's swim and this evening's yoga class are any indication, I'm in for another great week. Last night, my dear friend Carly and I were chatting about what I like to call The Switch: switching from 'just going out for a run' to running with a specific purpose in mind, switching from exercising to training, switching from someone who might workout today to someone who knows exactly how many minutes and in what heartrate zone she will run, bike, and/ or swim this morning and this evening. For me, The Switch happened last year as I found myself - a dedicated exerciser and back of the pack runner who knew she could go the distance, but never REALLY pushed on through to the other side - doing things I never thought I would or could do....like swiming hundreds of yards at at time, plyometrics, and 1 mile time trials in under 8 minutes. I became an athlete. That identity shift created a new intention for all of my workouts, gave purpose to the alarm going off incredibly early, and formed a new reality in which I now live my life. It made what before seemed impossible, just another goal to work towards. And it made the WORK it takes to reach that goal FUN. It made me actually look forward to weeks like this one, which is chock full of very challenging, speed-focused, VO2 max-increasing workouts. I think that the families living at Genesis Home have are also called to make a switch of their own. Choosing to change from what used to come so naturally - and often so destructively - to what comes intentionally. Today Tri to End Homelessness readers have a special treat - an interview with Genesis Home Executive Director, Ryan Fehrman. 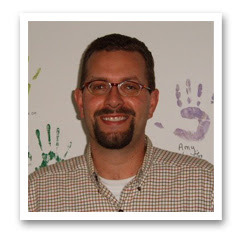 Ryan is a committed nonprofit professional, an advocate for change, and a dedicated multi-sport cheerleader. He also happens to be my husband. 1. 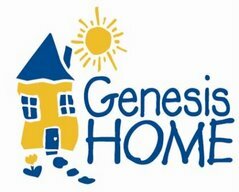 You've worked at Genesis Home for 6 years, in a variety of positions, including your current one of Executive Director. What inspires you to do your work? One of the first things that struck me about GH as a new employee was the family-like atmosphere amongst staff members. We knew each other as people, shared our interests, and did things together not because it was required, but because we wanted to. Whether that atmosphere is a reflection of the families we serve or a deliberate creation of the staff is harder to say. What I do know is that there was an immediate sense that I was part of something special, and that we would work together as a team to address whatever challenges arose from the work. As the ED, I try to foster this sense of team and comraderie because I believe that it results in a better quality of services to our clients. The second big inspiration for me, is the clients themselves. When you see positive growth and change, it reinforces your commitment and your belief in the importance of the work. The sense of accomplishment you see when someone gets the job they want; the pride of a child who gets a good grade in school; the joy of a parent who is moving into her own apartment - these are the things that make the job worthwhile. I know that we fill a vital role in the community and I shudder to think where some of our families would be if GH was not here to help. 2. Describe a day in the life of Genesis Home's Executive Director. There's no such thing as a "normal" day at GH. Depending on the time of year, some things are higher priorities because I'm staring down hard deadlines. Right now I'm doing a lot of reporting for our government funding sources and reapplying for government grants. The administrative burden associated with direct service provision has increased steadily over the last decade and every funder wants different reports covering different activities provided over different time periods. It's not my favorite thing to do but I feel strongly that nonprofits have to prove their effectiveness in the community to justify continued funding. It's not enough to say that you do good things - you have to prove it. GH is also in a strategic planning process examining our programs, partnerships, funding, staffing and Board functioning so I'm trying to support our facilitator with information and guidance as we move forward with that process. It's an exciting time for us and I think that the end product will be invaluable as the agency considers its role in the community and how we can improve our services. Today I'm also helping put together GH's annual report, doing a bank deposit, having one-on-one supervision with GH staff, making sure our computer lab gets de-bugged, and facilitating our resident house meeting this evening. Now you know how boring my job can really be. 3. What similarities do you see betweeen training for endurance sports and the work of ending homelessness? Maybe that you have to be slightly crazy to do it? :) You have to 100% committed and dedicated to the desired outcome or you won't make it. There are going to be bad days, tough days along the way, but if the goal is dear to your heart, you keep moving forward. Success happens one day at a time. 4. Endurance athletes thrive on goals. What are your goals for Genesis Home in 2008? Set a new agency record for families graduated into permanent housing (15). 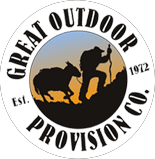 Complete a strategic plan that plots the agency's goals and growth for the next 3 years. Formalize and expand our Independent Living Program for young people (18-21) aging out of foster care. Add an MSW or licensed therapist to our case management staff to improve our clinical expertise and bolster our services to clients with mental health and substance abuse issues. Take time for self care whenever possible and continue to be a doting husband to my amazing wife. Monday - In triathlon world the day included a quick and easy morning swim and yoga in the evening. Nothing like a new swim suit and cap to make last week's super-hard swim disappear! In day job world, I actually started off the week focused, with plenty of sleep, not carrying 17 bags of gear and food! Tuesday - As my coach says, "an easy peasy run" followed by weights. In day job world, I checked all sorts of life maintenance errands off my list, got some laundry done, and actually cooked dinner for my husband for the second night in a row! Wednesday - The morning's swim included a 400 yd swim test. T-pace is staying pretty consistent, but my perceived level of exertion seems to be going down. Probably could have pushed myself a bit more. The evening included meeting the hubby for a beer after work...something that rarely happens on a training week school night. Yay! Friday - More cycling time in the AM, a day filled with lots of productivity in the office (love it when that to-do list gets checked off), and date night in the PM.